Elam was a parthian vassel state in the Persian gulf region, with it's capital at Susa. This is from a series of three princes who ruled between AD 198 and 224 whose names are not known, and even the sequence is not certain. These coins have no inscriptions to name the princes. Date : Morgan dates these to betweeen AD 198 and 224. Size : 11.9 x 12.8 mm. Weight : 2.51 grams. Reference : Mitchiner Ancient #723, Morgan 55. Obverse : Bust of the King left, in a somewhat barbarous rendition of a Parthian head dress. 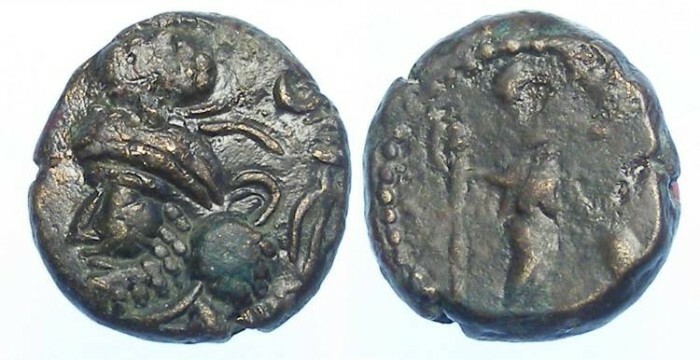 Reverse : Pallas standing right with a spear and shield.